PE0274. HULLO AMERICA! (Herman Finck; Cliford Grey, Elsie Janis & Dan Kildare), recorded 1918, w.Herman Finck Cond. 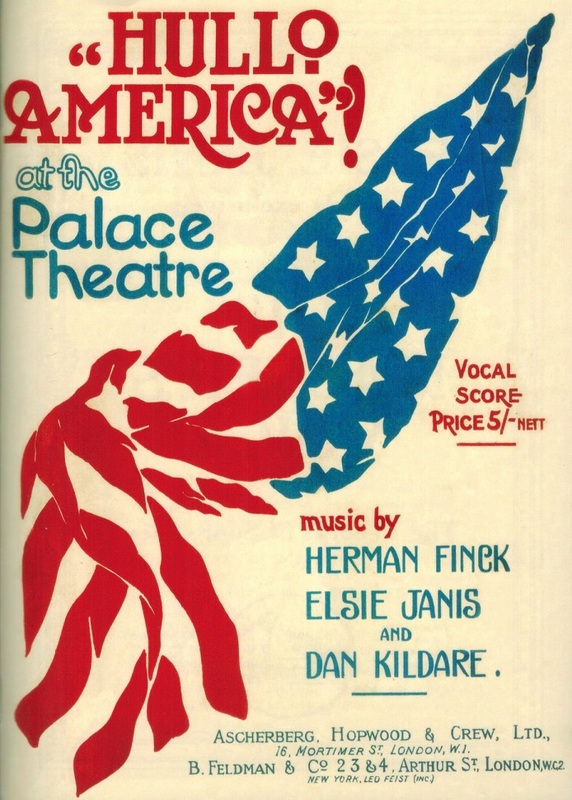 Palace Theatre Ensemble; Elsie Janis, Maurice Chevalier, Stanley Lupino, Owen Nares, Irene Magley, Will West, Arthur Fields & Billy Merson; Additional material by The Savoy Quartet. H. M. Coldstream Guards Band & The Light Opera Company. 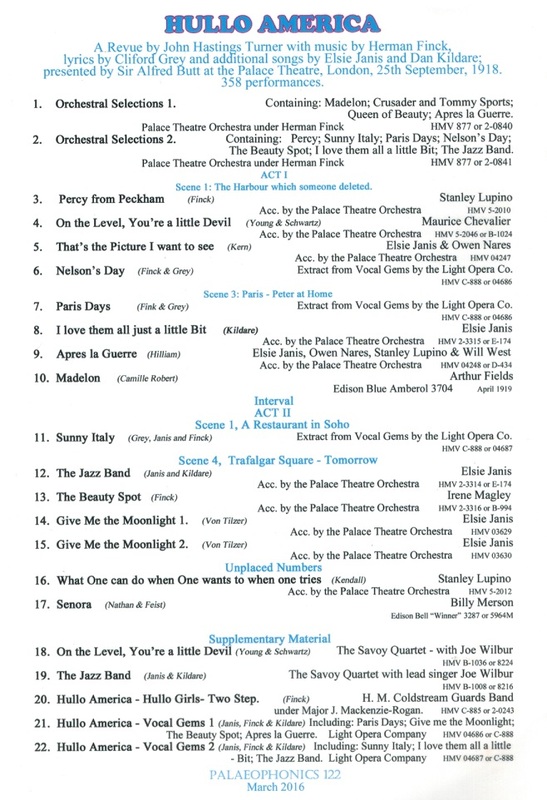 (England) Palaeophonics 112, w.Elaborate ‘The Play’ 18pp. Brochure, replete with numerous photos of the Palace Theatre 1918 production & biographies. Excellently transferred from the legendary Acoustic 78rpm HMV rarities. "HULLO AMERICA! was a revue devised by John Hastings Turner with music by Herman Finck. Lyrics were by Clifford Grey, and additional songs by Elsie Janis, Louis Bousquet, Lew Brown, Dan Kildare, Camille Robert, Jean Schwartz, Ray Sonin, Albert von Tilzer and Joe Young. It opened 25 Sept., 1919 at the Palace Theatre, London, and ran for 358 performances. Herman Finck was a British composer and conductor [who] began his studies training at the Guildhall School of Music and Drama and established a career as the musical director at the Palace Theatre in London (from 1900 until 1920), with whose orchestra he made many virtuoso recordings. During these decades, he was also a principal conductor at the Queen's Theatre, at Theatre Royal, Drury Lane and at Southport. Finck was a prolific composer throughout the 1910s and 1920s. He composed around thirty theatre shows of most types. Finck also conducted the first record album ever made (in 1909) of Tchaikovsky's ’Nutcracker’ Suite. The Palace Theatre was famous not only for its orchestra, but also for the beautiful Palace Girls, who had many dances composed by Finck in their honour. Finck also conducted the first London stage production of SHOW BOAT, in 1928. This was the first production of SHOW BOAT to include Paul Robeson in its cast. Interpolating war songs into her vaudeville routine proved very popular with American audiences and, after the U.S. entered the Great War, Elsie Janis got the idea of performing for the soldiers in action on the western front. No one had ever attempted such a thing before, and there was no money available to underwrite the cost. So, at her own expense and peril, Elsie traveled to Europe and began putting on shows for the American Expeditionary Force, sometimes performing on tabletops in front of headquarters. She was a huge success, boosting morale and endearing herself forever to American and British troops as 'The Sweetheart of the A.E.F.'. Only days after the armistice, Elsie repaired once more to the recording studio and waxed 'I Love Them All a Little Bit', 'The Jazz Band', 'Après la Guerre' - joined by fellow HULLO, AMERICA! cast members Owen Nares, Stanley Lupino, and Will West -'The Picture I Want to See' (with Owen Nares), and Parts 1 and 2 of 'Give Me the Moonlight', which features Elsie doing her dialect imitations and reading a poem dedicated to the British soldiers."